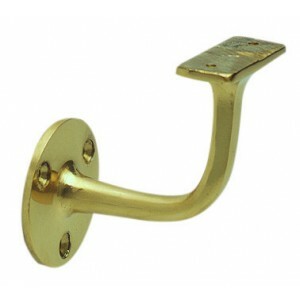 Easily mount a handrail to a wall with these handrail brackets. Wall mounted handrails are an excellent safety addition for stairs, hallways and other walkways. A handrail can become a decorative feature when attached with an attractive brass effect bracket that will highlight the natural timber of the handrail. A shiny finish gives brass a highly polished, extremely reflective surface that makes the metal almost look golden. Shiny finishes are a more modern style that has been gaining in popularity recently, and the warmer and softer shades of brass, burnished gold and hammered bronze have become popular materials.